Yes it's only just turned December, but already there's hype surrounding the festive season when Santa comes to town! Passing out on the sofa, a belly full of turkey and plonk, the eccentric Uncle declaring his love for Nigella Lawson's stuffing, and the Grandparents merrier than ever after their annual port and sherry concoction.... seems like it only occurred yesterday. But the stores are decked out for the big day already, and here at Cellardoor we're anxious to decide what to wear on this joyous day? Now i know you're thinking some elastic waist trousers and a maternity style top would do the trick nicely, after you've divulged enough festive food to sink a battle ship, but this year we're embracing the craze that's hit the high-street... Knit. 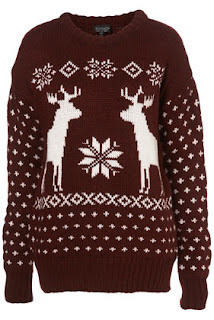 We're not saying we want you to resemble Bridget Jones in that fetching Reindeer christmas jumper, oh no.... we're thinking sumptuous angora knits with a subtle hint of Christmas, teamed with a skinny jean and sizeable wedge shoe, possibly a bow in the hair for a delicate feminine touch. Magazines like to encourage you to dress in sparkles and glitz on the 25th, but we think there's something oddly attractive about a good old-fashioned knit. So get on the hunt for yours! Knitted jumpers are definately on my xmas list! All these jumpers are so cute, they look so cosy! Appreciate your writing,and i am not wonder anymore when choose the gift.Packaging sometimes change it's value easily-A designer from who produce Glass Cosmetic Jars.